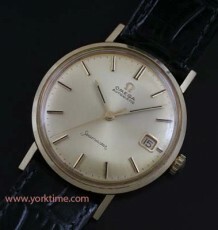 Outstanding condition vintage Omega. Model from the 1960’s. Gerald Genta designed with beads of rice bracelet. 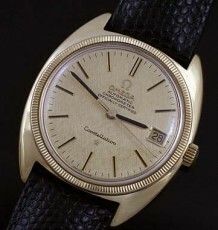 This vintage Omega Seamaster is one of the best examples I have come across in years. 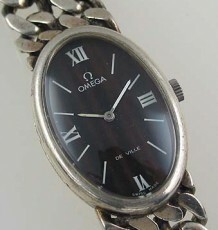 The watch has all of the traits the Omega has become known for. 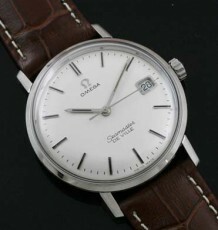 The simple and elegant case and dial combination was designed for Omega by famed watch designer Gerald Genta during a period when he did much of the design work for Omega in relative secrecy. The perfect satin silver dial features steel hour markers with black Onyx inlays as well as a framed date display at the 3 o’clock position. The watch has been reviewed by my watchmaker and is running like a champ and keeping excellent time. The Omega calibre 565 movement fitted in the watch has a quick set date feature. The serial number of the movement in the 25 million range, dates the watch to 1967. 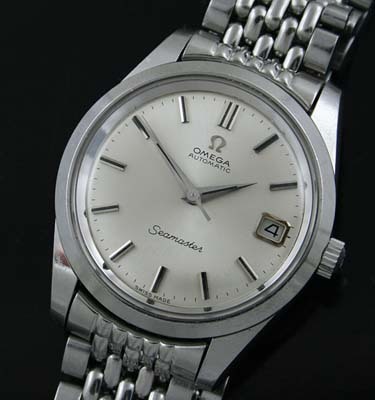 The solid stainless steel case is complimented by the original steel beads of rice Omega bracelet. The bracelet is quite long and does not appear to have resized. The watch measures 35 mm wide (excluding crown) by 43 mm long.